Sol de America Asuncion (Metropolitan League) agreed terms with 23-year old Venezuelan international small forward Daniela Wallen (180-95, college: Oklahoma City). She played last summer at Geelong Supercats in Australian SEABL-East. In 18 games she had 12.3ppg, 6.8rpg, 1.9apg and 2.4spg. The last season Wallen played at IK Eos in league where in 20 games she recorded very impressive stats: 16.6ppg, 11.5rpg (#4 in the league), 1.9apg and 3.1spg (leader !!!). 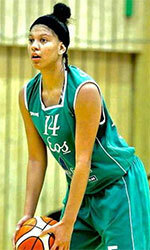 A very spectacular season in her career as she was voted Eurobasket.com All-Swedish Damligan Defensive Player of the Year, named to 2nd Team and League Player of the Week (2 times). She won NAIA D1 championship title in 2017. Wallen has been also a member of Venezuelan international program for some years. She has regularly played for Venezuelan senior team since 2013 and previously for U16 National Team back in 2011. Wallen represented Venezuela at the South American Championships in Tunja (Colombia) this year. Her stats at that event were 5 games: Score-4 (17.4ppg), 6.8rpg, 2.4apg, 1.6spg, FGP: 58.8%, 3PT: 40.7%, FT: 66.7%. Wallen graduated from Oklahoma City University in 2017 and it will be her second season as a professional player. Sol de America celebrated Apertura 2018 title beating Felix Perez Cardozo 2-1 in the Final series. They posted a 73-66 win in the decisive 3rd game. Sol de America grabbed a 20-17 lead at the end of the first period and led 39-34 at the halftime. The battle continued in the second half as well as the third period showed 56-52 after three quarters. Felix Perez Cardozo cut it to 67-64, while Sol de America had the final push to seal the trophy. 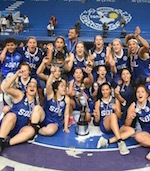 Felix Perez Cardozo tied the Finals beating Sol de America 72-66 in the second game of the Apertura 2018 del Metropolitano de Besquetbol Femenino de Mayores. Ariel Edwards (190-F-92, college: Penn St., agency: Ron Sport) top-scored for the winners with 21 points and Juana Molina-Prados (172-PG-91) had 18. Claudia Aponte (175-G-91, agency: ProDep Management) delivered 17, whilst Tamara Insfran had 10. Sierra Moore (180-G-94, college: Penn St.) answered with 19 points in a loss and Marta Peralta (171-G-93) brought 12. Carolina Caraves, Jazmin Mercado and Lucia Mendez (182-C-88) netted 10 apiece.